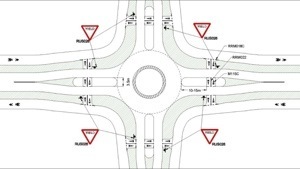 Design standards for the National Cycle Network and other rural routes have been published by the National Roads Authority (NRA) which gives motorists priority at junctions as a default position. The NRA is seen by many cyclists and cycling campaigners as having a very poor record on cycle route design. The standards also allow for 1.5 meter cycle paths and 1.75 meter two-way shared use path — both of which are narrow by best international standards and do not seem to be allowed in urban areas covered by the National Transport Authority’s National Cycle Manual. We’ll report on reaction and the elements of the standards as soon as we can. The standards document can be read on the NRA’s website. What does NRA stand for, is it “No Rothar Allowed or No Rothar Authority?